Lucifer‘s new season officially has a release date on Netflix…and an extremely steamy new shirtless video! Tom Ellis, the lead in the series, can be seen emerging from a pool looking super hot just as Netflix announces the May 8 release date. In addition, it’s exactly 666 hours from the time of this post that the show will drop on the streaming service! Here’s a tease from Netflix about the new season: Reeling from the aftermath of Chloe seeing his devil face, Lucifer faces a new challenge: Eve, the original sinner herself, is back. Does she want revenge for when he tempted her out of Eden oh so many years ago… or something else entirely? 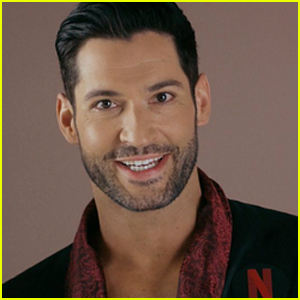 Tom Ellis Strips Down in 'Lucifer' Netflix Teaser - Watch! Tom Ellis is letting it all hang out in the new teaser for the upcoming season of Lucifer. 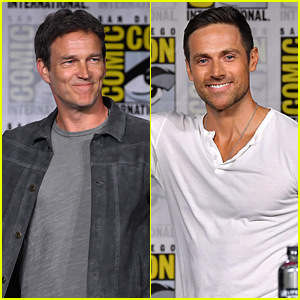 The 40-year-old actor stars in the new trailer released on Friday (April 5) alongside Lauren German, who plays Chloe Decker, and Inbar Lavi, who will play Eve. This is the show’s first season on the streaming service, and to celebrate, he’s teasing the idea that he’ll be showing a lot more of himself in a Netflix-branded bathrobe. There is no set release date for the fourth season of Lucifer, although it is speculated to debut sometime in the second half of 2019. Rebel Wilson stuns in a flowing burgundy floral gown at the premiere of Isn’t It Romantic! The 38-year-old Pitch Perfect star hit the pink carpet at the event held at The Theatre at Ace Hotel on Monday (February 11) in Los Angeles. She was joined by her co-stars Betty Gilpin, Tom Ellis, Brandon Scott Jones, Priyanka Chopra, Adam DeVine, Alex Kis, and director Todd Strauss-Schulson. Priyanka‘s husband Nick Jonas, Adam‘s girlfriend Chloe Bridges, Asher Angel, Blair Rich, and Tia Booth were also there to show their support. Rebel‘s co-star Liam Hemsworth couldn’t make it due to being hospitalized, but his wife Miley Cyrus was there in his place! Don’t miss Isn’t It Romantic when it hits theaters on February 13. FYI: Rebel is wearing Paolo Sebastian with a Tyler Ellis clutch. Priyanka is wearing Vivienne Westwood with Hueb earrings and a Brumani ring. Betty is wearing Missoni. Nick is wearing Kenneth Cole shoes. Asher is wearing a Canali suit. Hilary Duff and Sophia Bush pose for a photo while attending the 2017 Entertainment Weekly Pre-Emmy Party on Friday (September 15) at Sunset Tower Hotel in West Hollywood, Calif.
A ton of celebs were in attendance at the event, including American Horror Story‘s Cheyenne Jackson, How to Get Away with Murder‘s Jack Falahee, Dear White People‘s Logan Browning, Westworld‘s Rodrigo Santoro, and Inhumans‘ Serinda Swan. Former Salem co-stars and good friends Ashley Madekwe and Janet Montgomery both walked the carpet and former UnREAL co-stars Breeda Wool, Arielle Kebbel, and Jeffrey Bowyer-Chapman were seen mingling inside the party. 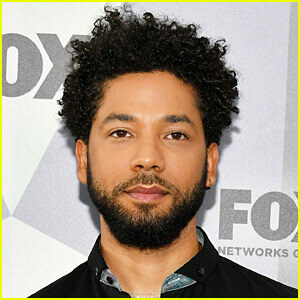 Some other stars in attendance included Lucifer‘s Tom Ellis, Ten Days in the Valley‘s Erika Christensen, and Friends from College‘s Keegan-Michael Key with girlfriend Elisa Pugliese. FYI: Sophia is wearing a Stella McCartney dress. Serinda is wearing a Temperley London dress. Arielle is wearing an Antonio Marras dress. Janet is wearing a Theia dress. Ashley is wearing a Jeffrey Dodd outfit.